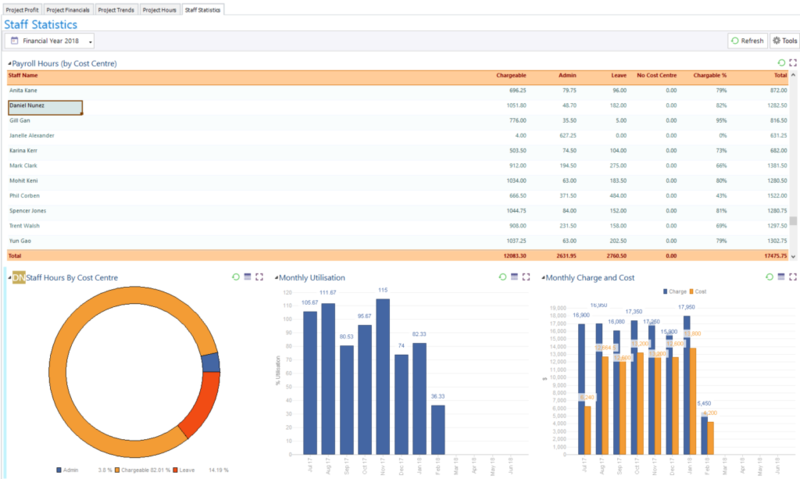 eTrack’s Dashboards are powerful and fast. 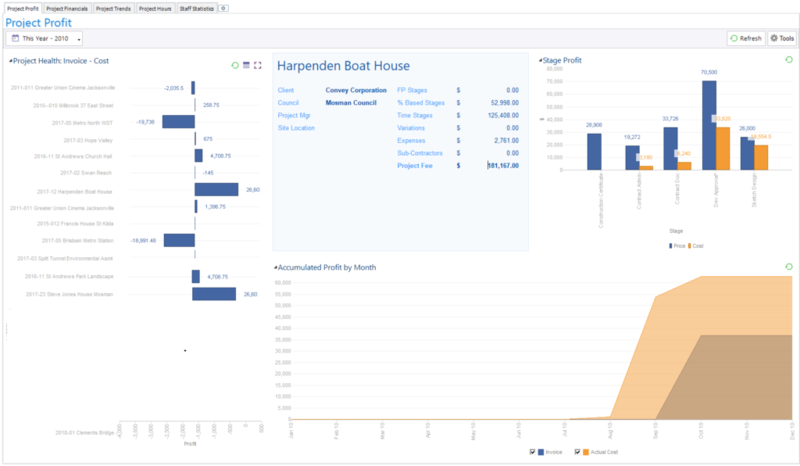 Multiple reports can be viewed on one dashboard and laid out in any way you choose. They are displayed in real time reflecting the absolute latest time and budget updates. eTrack’s built in Dashboard writer provides an easy to use wizard to clone and edit existing ones or build your own. You can add security and chose security groups and individuals to share them with. 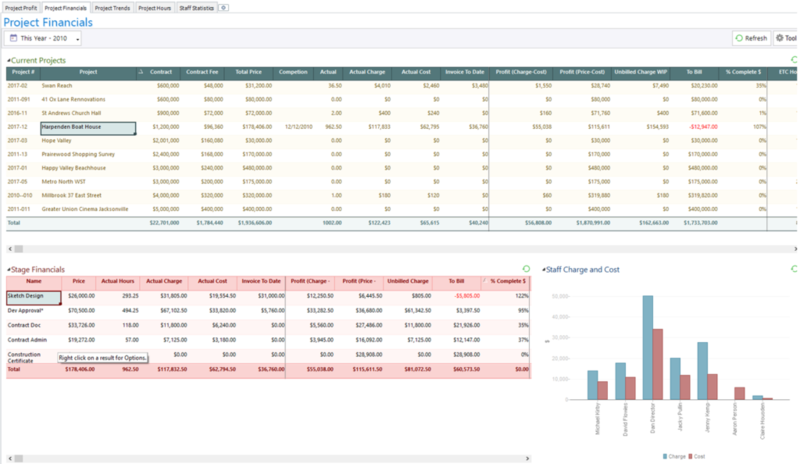 Staff can toggle between charts and tables, change the date range of the data viewed, and view a graph as full screen. The table view is dynamic and you can group, sort and filter. 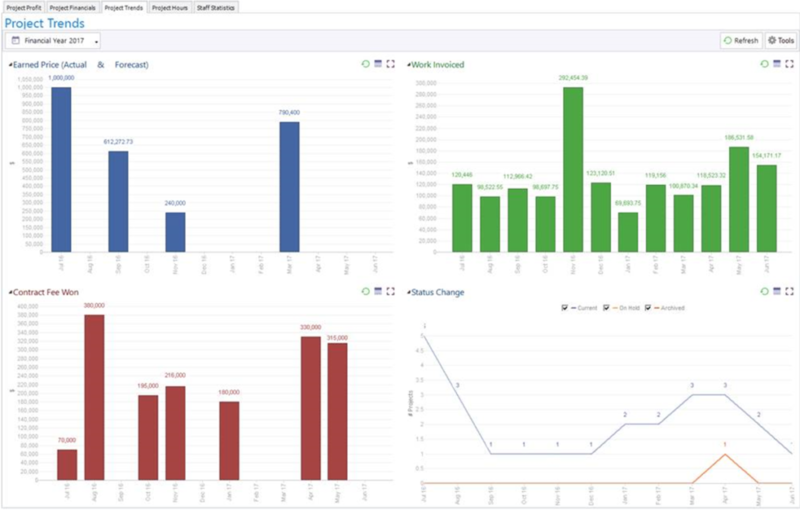 Here are some sample dashboards that come with eTrack. 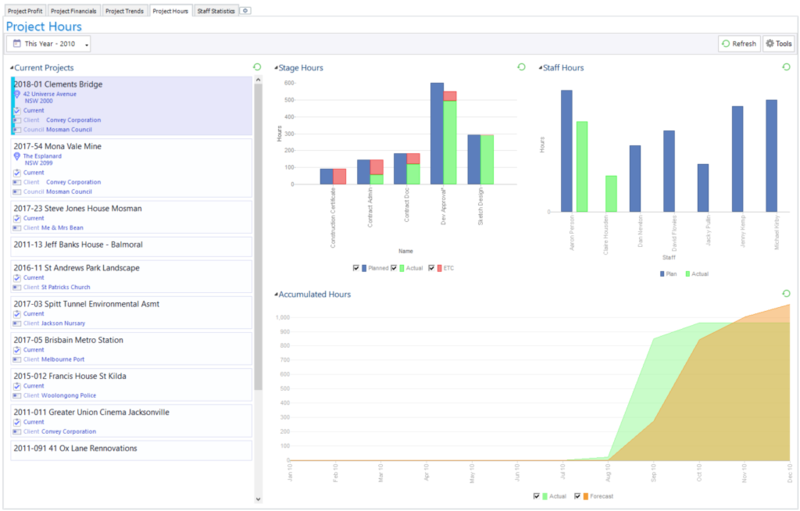 The project health graph on the left shows Invoiced–Cost as a pure and simple snapshot of the overall health of all your current projects. It might just be that you are behind in invoicing or that the project is losing money, either way it should be investigated. This really gets down to the detail of each project, showing hours, charge and cost, plus profit indicators such as Price-Cost. Selecting a project in the top table updates the stage details below and a graph showing charge verses cost of staff who have worked on the project. Selecting a Project card on the left will update Stage hours, Staff hours and a graph comparing accumulated forecast hours with actual hours. The Stage hours graph shows how actual hours from the timesheet (green) plus estimated hours to complete (red) compare with planned hours (blue). Trend graphs are a powerful way to see how your whole business is performing. Earned Value shows the Price of all Stages where the forecast finish date is within the month. Work Invoiced is the amount Invoiced where the Invoice Date is within the month. Contract Fee Won is the total of all Contract Fees where the Status was changed to Current during the month. Status Change is a count of Projects that change status within the month, giving an indication of throughput. All staff are shown in the top table with the timesheet hours for each Cost Centre. For the selected staff member the donut shows the hours by %; the Monthly Utilisation shows total hours booked to project work; and the Monthly Charge and Cost indicates the staffs profitability.